where i can found it? I just bought this set because I wanted the iconic banana. $700 in ToyTokyo retail store. Selling mine if anyone is interested? Oh wow! This one is great! Definetly! Would be good to know how many of them are out there. Always good to have another toy in glasses. any idea where to get this? smudge had a black one. Could you please repost those with just one photo of frontal view? It would be great to improve the tagging system. Its really hard to find toys. For example if I only search NY Fat this http://rotocasted.com/toy/7024/ wouldn't come up as I didn't type EXACTLY the full title into the search. Is this fixable? What we're improving right now is search system. It was ok when we had 2-3 thousand entries, but at this moment the Library grows faster than my ability to improve the service, that's why I have to ask for subscription fee. Partial name match as the search result is fixable, we'll do this shortly. Editing. I don't think giving rights for everybody to edit everything is the way to go. In this case the whole library will be a mess. You either can suggest fixes and images in the comments section, or ask me and join our friendly group of moderators. when searching for toys, try always using the auto suggest - both for toy name and artist. input the minimal amount of info into the search and see if slightly different dpelling comes up. Congratulations, everyone! And what a great toy it is! Next week we're going to wrap up 10K celebration. To order just email them. I never get through their shopping cart, but they're ok on taking order through email. They are great people to deal with. You'd be amazed how small the shop is compared to the impact they've had on the Tokyo toy scene. Not much bigger than a rich person's walk-in-closet! Seoop is an enthusiastic sushi chef, whose restaurant is located in a busy Australian subway station. His passionate nature often scares customers, but he always means well. When he's not slicing & dicing, Seoop is flying off with his trusty jetpack to retrieve exotic - & occasionally tasty - morsels for his restaurant’s kitchen. Too bad he's never been released. Do you have any more information on this, Sergey? I don't have any further info, unfortunately. But this minitreehouse serie came through many many obstacles. Another Minitreehouse obstacle: Heenie Night Edition had defects that caused the arms to break, and a new run was never produced. Many were recalled, so the ones you can find for sale will break when you try to switch arms. Boo. Okay, but why's she here? Sometime this year we have to decide what to do with all the action figures and character toys. Qees have keychain attachments so they can be worn as accesories. Your point is moot. is not. they come unassembled, so keychaining qee is an option. you can wear almost anything as a keychain, but you wouldn't put in your toy collection. and the point was that this revoltech is much more a collectible toy than a keychain. I think a debate could go on for ages about what can be deemed a toy suitable for Rotocasted, but I thought Rotocasted started for collectible toys i.e. 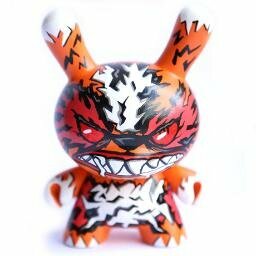 art toys and designer vinyl. I wouldn't class this figure as either. It's an anime related action figure, which I class as something completely different... but then again, the 'Type' tag is there to differentiate between all the toys and their kind, so I don't see why all toys can't be on this site as long as their correctly tagged as whatever kind of toy they are. I was just saying about the keychains thing, because everyone by now is probably aware of my slight Yummy Breakfast addiction, and although it is a keychain, I see them as mini art toys, because of their humble beginnings as Heidi Kenney's handmade felt creations. Then obviously Kidrobot got involved and saw the potential to bring her creations to a wider audience. I just clicked on the 'Keychain' tag to see what else I can make examples of, and although I can't stand Kaws, the keychains of his are in a way, shrunk versions of his actual art toys, which is pretty good for people who can't shell out hundreds for one of his proper figures. Anyway, I could write all day about this, but I think I've got my point across. So how would you all classify my custom 1 of 1 Elissa Shutak action figure that I paid someone to make me? You've confused and disturbed me. Thank you Shankweather. The problem is some things should definitely be on here and some things definitely shouldn't, and then there are a lot of of things that maybe could be on here. But once you put the grey area stuff, then the things that shouldn't be here start appearing. I, for one, think mascots and advertising figures are a definite no no. Others are strictly against toys of characters from movies or comics. It gets complicated. The toy world itself is pretty ambiguous and we've been having this discussion in different forms for a while. There are a lot of things here that might clearly be art, but that aren't toys, like for instance the busts of Mao with Mickey Mouse ears. That should fall within the grey area aswell (or even be immediately dismissed), since it's a sculpture rather than a toy. My opinion is, allow everything, but make it easy to sort through it with clear classifications and such as. People will always have different opinions as to what is art and what is beautiful. @Shankweather, can I borrow that when your finished with it? It must be 'Weird Liss Out' day today, fo' sho'.